Today, we are releasing what we consider one of our most substantial features to date - The Elementor Popup Builder. Limited (if any) design customization for popups. No way to include website content inside popups. A different interface for your site and for your popups. Setting up advanced targeting is a complicated task. A popup feature was consistently ranked among our top feature requests since pretty much day one, but we wanted to do it right. So we spent months figuring out an entirely new process that faced each of these challenges. Just like the Theme Builder, Popup Builder offers a new and better way to build and manage popups. We tried to create an intuitive process that would be entirely handled in one single and familiar editor – Elementor. One of our main achievements here is creating a single workflow that will allow you to build popups as part of one web building process. Every step of your web creation process – from building a landing page, creating the popup and hooking it up to the page is made in one place. Building highly-converting marketing funnels has never been easier. Achieving the highest level of design and maintaining proper design consistency are two fundamental values for any web designer. Having one design interface that manages your website design as well as your popup design is the only way to properly achieve this. When I think back of all the switching back and forth between screens that popups involved, I feel sorry for all the hours we lost. No more wasting time! Your Content, Your WordPress, Your Elementor. Designers create amazing Elementor templates and global widgets that are used all over their site. It makes sense to use the same assets in popups. You see where I’m going. Everything you’ve built for your site, should be easily accessible and added with a simple click to your popups. Adding your assets is especially crucial when it comes to forms. By incorporating Elementor forms, you are able to integrate popups into your favorite email marketing tools by simply adding your current forms. No extra steps needed! As we already mentioned, Popup Builder lets you take advantage of Elementor’s various design, layout and styling capabilities to create fine-tuned and out of the ordinary popups. Use its various widgets, mobile editing tools and advanced customization to really have your popups stand out. Get inspired by our templates, and notice how we created popups that don’t really look like popups. An example of this is the popup that uses transparent backgrounds to ‘step out of the box’. Elementor Popup Builder lets you customize not only the content of the popup, but the popup window and surrounding design as well. For the popup window, you have full control over the layout, including height, width, horizontal and vertical alignment. You also have full styling options for the close button and the overlay. Forget about the boring popups you used to know. Start experimenting and creating imaginative popups that communicate more closely with the design language of your site and brand. Once you are satisfied with the popup you created, we can hit publish and set the conditions, triggers and advanced rules for your popup. These settings help determine when and how the popup appears. Conditions are pretty straightforward and work for popups in the same way they do for all other templates in Elementor. Choose which pages, posts, and areas where your popups will be displayed. Triggers help set off popups based on user actions (i.e. click to open popup). Browse the different triggers: On page load, on scroll, on scroll to element, on click, after inactivity and on page exit intent. Advanced Rules determine the requirement that must be met for the popup to appear (i.e. user visited the website at least two times). If the user visited a certain number of pages, visited a certain number of sessions, arrived from a specific URL, arrived from a certain source, has a certain user-role or is using a certain device (mobile, tablet or desktop). By combining different rules, you can set popups for a specific audience, such as users who still haven’t converted to clients but who have already visited your site before. You can set off popups either by customizing triggers (as described in the previous section) or by setting a manual trigger via a link or form. To get a link to open a popup, go to the link, click the dynamic icon, then Actions > Popup. Click Popup > Open Popup > and select the popup you created. You can have the popup either open, close or toggle between these options in a single button. The toggle option is useful for popup menus. Elementor forms can be used to open or close popups. If you’ve included a form in the popup, go to Forms > Actions After Submit, and choose Popup > Close Popup. Similarly, if you want an external form to open a popup, go to Forms > Actions After Submit, and choose Popup > Open Popup, and set the requested popup you want. Keep in mind that these popup templates are not the only templates you can use. Incorporate any Elementor template or block inside popups, whether it’s your own custom template or Elementor’s pre-made ones. Combine different widgets, templates and targeting settings to create any type of popup you can imagine, including: email subscriber popup, login form, content lock & upgrade, welcome mat, promotion popups, exit intent popups and more! With Popup Builder, we managed to create the ultimate tool that offers superior design as well as marketing advantages. You get an unparalleled level of design customization, made possible with all the power of Elementor, with its various features and widgets. Take advantage of the targeting engine we built, and segment popups according to page-based, time-based, device-based & visitor-based targeting options. Get Elementor Pro today and start making popups that your visitors will love. My pro subscription really worth it ! Espectacular! Cada vez mas poderoso Elementor….Saludos desde Colombia. You ROCK ! Elementor is the best “thing” (whather that thing is) that happened to WordPress ! You even included “On Exit Intent!” Thank you for making this! I love you Elementor! ? You are moving ahead of the pack with this new Popup builder… Congratulations! Awesome, can the popup trigger by CSS class? how should a popup be triggered by a css class??? I think what wayne is referring to is triggering a popup by adding a class to an html element. The current popup URL generated using the Direct Link method specified above is a bit of a garbled mess from an SEO standpoint. I’m still very excited for this feature. Ben are geniuses! The best dollars invested in my 15 years in web design! Amazing system, looks like it has everything popups needs. Great job! Please give us some animations / 3D effects and widgets to make our sites even more exciting. 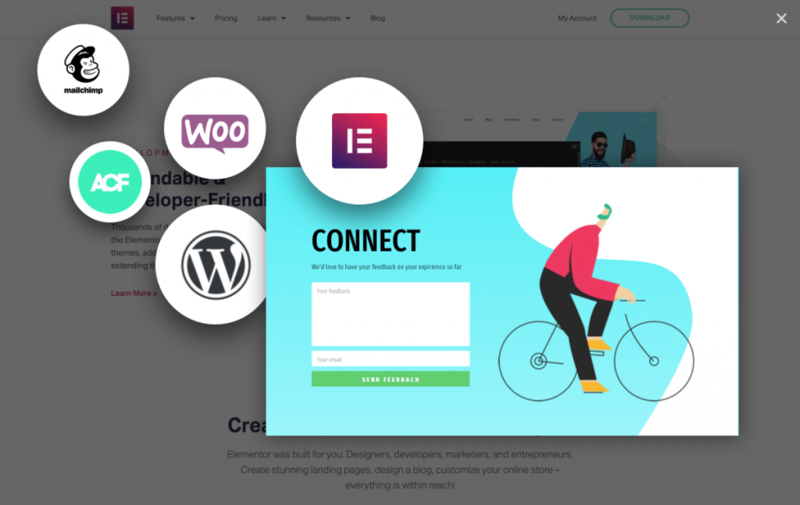 You created WooCommerce Product Builder…but it’s high time to provide options to configure the rest WooCommerce pages by Elementor. You guys are rushing ahead of Divi. This popup builder is awesome with great features. I love you man!!! Just AWESOME!! I like forms too, but would like to see more features added to the form widget. This is awesome! Thank you Ben and the team! Looks great. Can’t wait to try them out. Incredible addition!! Keep up the outstanding work! In like every other feature they put out – they are thinking a few steps down the road and make sure you will no longer have needs to any other extra plugins. Only a question: how can I triggered a popup with a click on a specific ID button? You can trigger by using ‘Scroll to ID’, or trigger manually to a link by clicking on the dynamic icon next to the link field, Actions > Popups, choosing the popup and that’s it! Can you set the popup to change state after submit? So, just load a different popup design inside the current popup? Use case: visitor clicks a popup link, subscribes to our list to get a download and the popup changes to a success state that offers a tripwire product. how can I change trigger conditions after I have published a Popup? How can it be avoided to open a Popup again, when it has been closed by the user? There is an arrow next to the Publish button that opens the Publish settings with triggers. I’ ve been expecting this feature integrated in Elementor for a long time and voila is finally here. 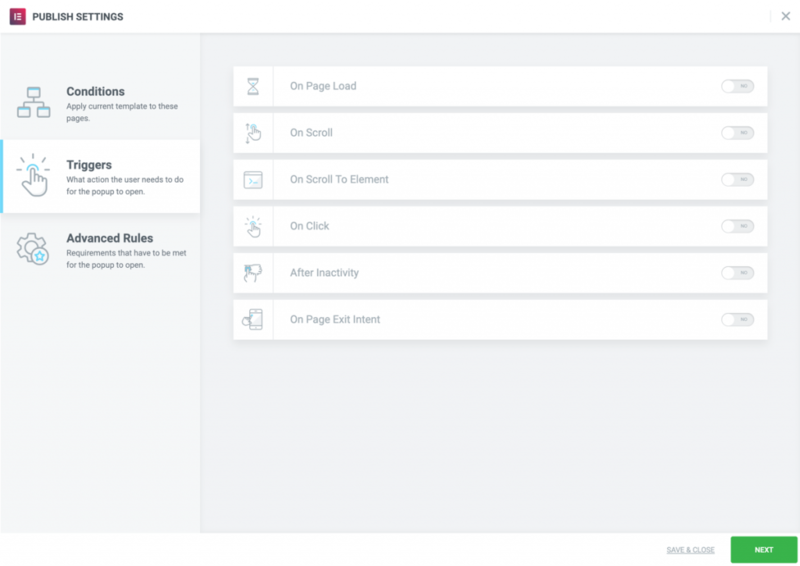 Ok there was a plugin developed by someone as a solution until now but seeing that now you can use it on page scroll, on page load or on exit intent, it opens a new era for using Elementor, especially for affiliate marketing. It is a big step forward to replace many paid services. Thanks ! Thanks! yeah it’s great for affiliate marketing I agree. We will have more marketing related tutorials for popups in the future. I updated Elementor Pro but no pop ups show up under templates. Can Popups be programmed with date and time of publication and turn off? Love it! Please can the posts widget be overhauled next? It would be really awesome if it had more options. It’s so bare bones compared to what you can actually do with a single post pages. Plus, single post pages can have custom content and meta data, and the posts widget can not. +1 I keep running into the need to extend the functionality of the posts widget as well. Specifically, needing the ability to pull custom fields in, and more styling control (ie: placement of categories/tags/custom fields). It would also be exceptional if the posts lists could pull up single views in a pop-up. Example use case: a college website with a big list of courses. Instead of clicking to see the single view for each course and then clicking back to the course list page, it would be nice to pull up the single views in a lightbox but remain on the list page. I could see this being true for many use cases where the single view doesn’t have a lot of information. Keep it up! I’d happily page even more for your builder. The value is exceptional. Is this Thrive Leads just set within Elementor? Can you explain any differentiation? Looks great btw, just curious if it’s indeed a viable/better alternative. Thanks! There are many popup plugins. None offer the same design level, the same UI, speed, interface, targeting, ease of use… The list goes on. My god I love Elementor. Nice one guys! Thank you very much, keep doing the good job! Great new feature! Unexpected, actually, but great further development after the background-image features for mobil! Every website needs conversion and call to action tools. Hi! Popup feature is just GREAT! Is it possible to connect a popup with specific button click in our website ? For example I want to enable the popup when the users click on call to action button. Ok! I found how to do that! Is this an automatic Elementor Pro update, or do I have to update manually? Thanks Ben! Yeah they synced with us and are also releasing over 100 templates. YAY! BTW – the Popups are awesome! YESS ELEMENTOR I LOVE YOU. NOW JUST MAKE A PRODUCT FILTER. You can use the Portfolio widget to make product filters based on content type / category. Can I have a video in the popup? Will this replace 3rd party modal plugins? But it needs an option “open with css class” if I for example wants to open a login popup from a menu not created in Elementor. Amazing stuff! I know it’s probably hard to implement, but here’s a suggestion for something I would love to see in this new feature: Including a Geo rule in your “advanced rules”. That way, the popup would be shown only to users from selected countries. And the other way around as well, excluding some countries. That would be extremely useful for affiliate bloggers like me, who have different affiliate links for different countries. It would also be great for a GDPR slide in, to be shown to European countries only. But still, great addition guys! Cheers! My Elementor Pro there´s no pop-up widget, do I have to install some plugin? First update Elementor plugin. THEN Elementor PRO plugin. Refresh browser. Boom goes the dynamite. After have upgraded to 2.4 Pro, I can´t edit any page anymore! A button appears instructing me to switch to Save Mode, I do it but does not work ! Hi, are you able to trigger a popup from a menu item? Really great work BTW, Elementor a very useful!!! OK fantastic. I’ve been playing with it and answered my own question, then found a bug (maybe). – VIDEO? Yes. You can put any Elementor content in the popup. It’s a modal and works great. The bug is with the close button “X”. Although I put is as “outside” and changed the position in responsive mode, the “X” still is all over the place for both mobile and desktop. Check that out. It looks fine in responsive mode, but looking at the live page with no cache, the “X” floats on top of the video and is not positioned correctly. Thank you for this! Can I trigger a popup from clicking a menu item? Thanks. I think another way to explain it would be to suggest using an icon, use the “menu” icon if you prefer, or any other and use the pop-up as a way to present a totally unique site menu! Simply amazing! It’s like you guys read my mind because this looks like exactly what I was looking for on the site I am currently developing with Elementor. Are there plans to be able to integrate the popups with other popular wordpress contact plugins (or is that already possible)? Massive hats off to Ben and the rest of the amazing Elementor team, you guys are phenomenal! Hey Ben. What a breakthrough. I was initially using a plugin for popups that worked really well and concentrates on conversion. Without mentioning the name, you probably know what product that is. Problem is, it’s quite resource intensive. Since then I had used 2 different plugins (that work with Elementor) and found problems with both of them – names withheld. So, with reluctance (because I love website speed), I reverted back to the original product. Thank heavens my Elementor templates are saved. Now I achieve everything I need without any (other) external plugins. Whoo hoo! Now all you guys need to do is include tables! That’s the best testimonial anyone can ask for 🙂 Thanks! “interactive comercial entertainment experience” !? POPUP missclickers are not really a base for a happy customer. And only happy customers come again. Might bring a bit mor sale rate on the first sight, but lots of more countermands then…..An outlook to the future might appear as a nightmare…. The problem with these kind of webtools is, that they are mostly used for tricking and missleading visitors – doing things they dont want to do…. Wow this is just incredible, well done to the Elementor team!! This is awesome! I got an idea…create a unique site nav menu via pop up! Is it possible to have the popup only opening on a certain day? ie “Phones Open Saturdays”? Awesome video, great new feature. Video totally rocks!! Shapo guys. Without a doubt – you rule now! How do I access this popup builder? I’m new to Elementor(and new to building a website) and still getting used to using it, so I’m probably missing something, but I don’t see it? I’m using the current version of Pro. Can I make a wordpress registration landing page? You will need a membership plugin to create it. This is EPIC!!!!! I can’t wait to start deploying this. Thank you for simplifying our lives Ben (and the rest of the Elementor team). The best thing I’ve seen in this year 😀 LOVING it! Thanks guys for your hard work! You’re the best, you’re rock on the market! How do I activate the popup by clicking? I want it to start only when you click instead of just loading the page. The same with me. There is something strange with layers. Images are at the front layer covering the text when should be at the back. Contacted the Support. my apologies – it was indeed “essential addons” plugin’s fault. You will need the latest versions of Elementor & Elementor Pro (2.4.3 & 2.4.0) in order to be able to use Elementor’s Popups. Please go to Dashboard -> Updates (in the upper side) and see if Elementor Pro shows up there. You can check it and press the “Updates plugins” section. If you don’t see any Elementor Update available, please try deactivating & reactivating it.
? Most awaited cool feature now available! ? Although we can create from scratch as of now but it would be great if there are Scroll to top button templates within Popup Builder. Hope to see that very soon. I have the PRO version and I would like to use the Hello Bar but I have seen that there isn’t Aweber. Could you add it, please? At the moment, you can use Zapier for that. 1.- When creating the popup, a WordPress page template is assigned by default, which does not allow modification to assign a different one. 2.- Once finished creating the popup, there is no way (at least easy to find) to re-edit the display options (conditions, triggers, etc). I think this option needs a revision yet … I hope it comes soon. 2. To Re-edit – Click the triangle next to “Update” button. Then click Display Conditions. How do I link a pop up to a sub-element of a navigation menu? Currently, it’s not possible but we’re working on it. However, small issue with launching a pop-up from a button click (dynamic content); When the pop-up is closed, it can’t be re-opened (unless the page is re-loaded, obvs)…? I found a problem loading the article on this page and it was an image in the “Power of Elementor” section, but it was a video file that was not being played. by the way i am using (ONLINE SHOP) theme. what do you think should i do ? is there a possibility to show a popup on one specified page only? Contact Form 7 doesn’t seem to work if used within the popup – is there a solution to this? Yes. You will need the latest versions of Elementor & Elementor Pro (2.4.3 & 2.4.0) in order to be able to use Elementor’s Popups. OMG this is going to be game-changing. Thank you so much!! Most awaited cool feature now available at Elementor. Hey Ben, is there a function to not show the popup if they have already submitted the form within the popup. Otherwise, how do you suggest I exclude a single page (i.e. my thank you page)? Really awesome work guys, I just LOVE it! Does it also provide an option with “If an user comes from a certain geographical location” and then show a pop-up? Can you create multiple submissions to different email providers for one sign up button? (To allow being added to 2 or more different lists? Yes, you simply need to specify the relevant platforms under Actions After Submit. You guys are really great. I have an issue though. My popup works correctly with the button click. However it is ALSO coming up on page load. No conditions or triggers were set. I just want it to appear when someone clicks a button. How do I resolve this? Guys, I created a cookie bar and found that you can simply reload the page to remove the message rather than clicking on the close button, Is there a way to resolve this? Also found the popup didn’t work at all on IE 11. This giving me headache, why i can not set conditions for englisg version of my site? it looks like doesnt see them at all, only main page titles. Any advise? Where should it appear or how do I find it? Hi elementor ! the hello bar will block my top menu, is that anyway that i could make the top up bar above the menu? Most awaited feature. Awesome update. Good job, can a complaint be encouraged when you close popup? The Popup Toggle does not work as said. I created a hamburger icon and a popup menu. I set the burger icon to toggle the popup. When i close the popup menu and again click the burger icon it does nothing. I contacted support and they told me to put it up on elementors GitHub. Think that if the toggle feature does not work then it should get taken out or give us an easy work around. Love the product dont always feel like a get a personal response for support and feel its more cut and paste with out taking my question with care. Same here…toggle popup doesn’t work. I have created a pop up for a client after watching your video below. All looks good but how do I animate the hamburger mobile menu button from = to X. I guess I am looking for :active state. but don’t know where to find it. Thank you ELEMENTOR I just saw the seminar in YouTube about the POPUP and all was clear, congratulations it is a great help for all my web pages. Awesome. Thanks Elementor for creating such an awesome popup builder, Great Job done by you guys. How can you have a pop button placed over an image? Every time I try to move my absolute positioning button over an image ii disappears. Is there a way to bring it to the front so it always appears? WOW. That’s amazing. I’m glad that you people introduced this, I feel like this is going help me a lot. Thanks for everything! Elementor is LOVE! Can we have Mautic connector with pop-ups ?